Music Whenever; Lykke Li, Bon Iver "Dance Dance Dance"
Lykke Li & Bon Iver doing 'Dance Dance Dance' in L.A from Lykke Li on Vimeo. I seem to be stuck on the old, the vintage, at the moment. It's just that so much fascinating old stuff is pouring into Earwigoagin Central that I must ride the wave. So.... expect more of the same. Two interesting Videos just popped onto my radar. The first covers the British Moth Championship of 1956. I wrote a previous post on the British Moth. Suffice to say the British Moth is the most popular Circle M Moth going these days. And an old video from the mid-60's featuring the Solo dinghy racing in Holland. Again, I wrote about the Solo dinghy in a previous post. The Solo seems to going from strength to strength in England, registering 70+ registrants in the last 5 UK nationals despite the relentless Laser Borg. This 12' home build singlehander, popular in the South of Australia, is a favorite of blogger Joe Rouse over at the ever interesting blog, The Horse's Mouth . According to Wikipedia, the Sabre was designed by Rex Fettell in 1974. A simple V-chine design, the hull weight comes in at 90 lbs. (41 kg. ), a little lighter than the Europe Dinghy but still a lightweight compared to most other singlehanders out there. Building a Sabre has been documented with lots of photos at this website . A picture shamelessly lifted from the Woodenboat Forum. 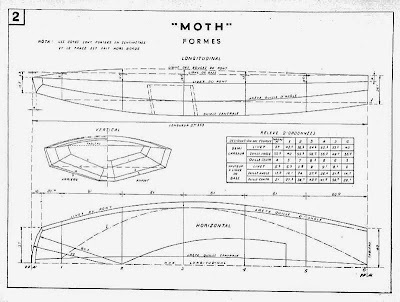 Classic Moth Plans; Metric Offsets for "Little Mae Too"
Plans de voiliers classique Moth, plans d$#233;riveur classique Moth. As promised, here are the metric offsets to the Vintage Moth design "Little Mae Too". It might help those tired eyes trying to decipher the blurry offsets from the drawings. I've been a small boat sailor for most of my life. When you get as heavily into racing small sailboats as I had in the past, you get somewhat jaded, you forget that thrill of just scooting along in a small boat. This video of an Englishman whooping it up in a Topper scow brings back the joy I felt as an eleven year old sailing the family's El Toro. Just as I was lamenting the lack of young people interested in building their own boats, Pete, the son of my good friend and Classic Moth buddy John Z, comes home from college for Christmas break and puts together a CLC standup paddleboard in two weeks! With such a short timeline, Pete put together a daily schedule using a spreadsheet. And stick to the schedule he did as the completed paddleboard went back to college with him. Pete with hull done, awaiting deck. Pete doing the final fit out. Pete paddling somewhere near Duke University, NC. 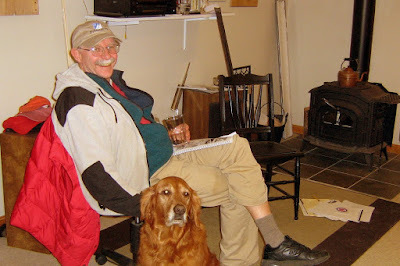 And your blogmeister, lured by promises of a swig of the nice dark Norwegian stout John received over Christmas, showed up one night to supervise. I just recently posted about the Francois Vivier French Classic Moth plywood kit . Just looking at the illustrations, it appears to be a stable, capable Classic Moth design; probably fitting into our Gen 1 division very nicely. It turns out that Clint Chase Boatbuilders in Maine can offer the plywood kit from the U.S. I don't have complete info on the pricing, but initial emails with Clint indicate the cost would be very reasonable. If one was to jump into building the kit, I and others within the class would gladly fill in the blanks on the rig, sails and blades for the Moth. Clint's boat kit website can be seen here. Music Whenever; Nicole Atkins "Neptune City"
Neptune City - Nicole Atkins from frantic studio on Vimeo. I got an email from Duncan, asking for some clarification on Classic Moth designs. Operating on the presumption that, if Duncan is confused, there may be others in the bloggosphere with the same question (then again, maybe not), I've decided to put my reply to Duncan in this blog post. "Would [you] mind identifying some Moths from the pics on your blog. I'm in the process of finding a dignhy design to build from. The boats that caught my eye are: The third boat from the left in the first pic from your blog entry on Nov 18, 2010." Duncan is referring to my Cooper River frostbite post. In the group Moth photo, the third Moth from the left is George A's fiberglass Olympic Europe dinghy (Correction from George, actually Ed Salva's Winner Europe dinghy), a very popular class in it's own right in Europe and South America. It's very hard to get plans for the Europe dinghy from the ISAF. They will send measurement offsets for a fee but when these are plotted out, there is not enough information to make station molds. George, Bill and I took some lines off an old Europe several years ago. There has been talk of doing a stripper Europe off these lines but, so far, no one has taken the plunge. Walt Collins is also talking of doing a multichine plywood Europe shape. He was hoping to have something drawn up by this summer. If you would like George to send you a copy of our Europe lines for a nominal fee, mosey on over to the Classic Moth website for contact information. "Jeff Linton's Florida Mod Mistral (or Mousetrap?) from your blog entry on Oct 25 2010. Are the Florida Mod Mistral and the Mousetrap the same design? From outside the Moth world I was not sure if this was the case." Yes, what I refer to as the Linton Mousetrap design and the Florida mod Mistral are one and the same. Essentially the Mistral design (and the Mousetrap design) are bent up into shape using two 3 mm plywood panels, a starboard and port panel. "Stitch and glue video here." Instead of using the normal rounded Mistral transom, Jeff used a wider transom, supposedly copied from the Europe dinghy but, to my mind, a somewhat different shape given the difficulty of bending plywood. Refer to this transom picture of a Mousetrap from Len Parker. 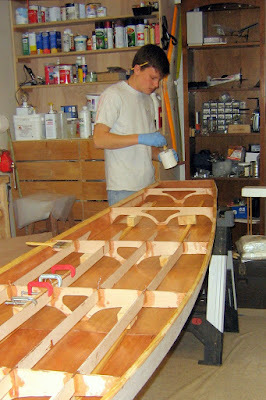 With more transom, Jeff had to futz around with the sheerline, giving the Mousetrap's aft deck a reverse curve not seen in the Mistral. 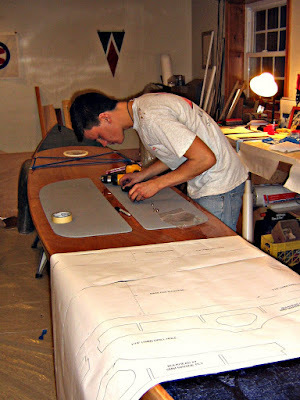 To build a Mousetrap, get a hold of the Mistral plans and then you are on your own for the transom shape. Greg Duncan with his home built Mousetrap variant was featured in this post. Not sure what this song title is. I guess RIB's (those V-bottom inflatables) would make the best crash boats but I must honestly say I've never operated one as a crash boat. (I did recently work out of SSA's RIB doing mark boat work, the soft sides do make it nice when you're leaning over, hauling anchors and marks.) The really difficult part about rescues is dragging sailors out of the water and onto the rescue boat, particularly ones who are so exhausted they can not help pull themselves into the boat. Many crash boat operators seem to be content to work from their crash boats. But there are times when you really need to put a competent person overboard to complete a rescue. The key is the safety of the competitors. If the skipper, or crew, or all of them are exhausted or cold or dazed they should be retrieved onto the crash boat. If the person in the water is inexperienced, they need help. I usually take a complete sailing kit on the crash boat. I've changed into a wetsuit and gone into the water several times to right a boat because the crew is borderlne hpyothermic and incapacitated, or the boat is waterlogged and needs a steady hand on the tiller while we tow it. Ideally in the really rough stuff, it would be nice to have three on a crash boat with one designated as a swimmer if need be (I know this rarely happens). And all crash boat operators need to have a good sailing knife readily at hand. When the crash boat goes in for a rescue it's usually for two things; a breakdown that has rendered the sailboat unsailable or a capsize situation that has rapidly deteriorated (a capsize, then a righting, to another capsize, to another righting, to a capsize, to a very tired crew sitting on the daggerboard). For that second situation, when I'm faced with an exhausted crew or a crew that has had difficulty in righting the boat, I make a beeline for the mast. My goal is to get the mast pulled up and then laid across the crash boat. It may take some work (I'll even work extremely hard to pull up a mast of a boat that may be attempting to go turtle) but it makes much shorter work of a rescue. For a tired crew, the key is to get the sails down. It is extremely difficult to get the boat righted, a crew onboard and the sails down, without capsizing again. If one can get the mast stabilized on the crash boat, it makes it much easier for the crew to work at the halyards from the water. The boat is stable on her side, the sails aren't flapping a mile a minute. The crash boat operators can help lower the sails, or if need be, release the halyard shackles if there is a problem with the halyards being snarled up. Many times it makes the situation more manageable if the crash boat operators just takes the sails from the capsized boat and stuff them onboard the crash boat. Once the sails are off, getting the boat righted and under tow is much easier. I've gone for the mast rescue on dinghies as big as a Lightning and catamarans as big as a Nacra 20. When the wind is strong and the waves are lumpy, this is most often when crash boats are needed for rescue, and this is also the worst possible combination for low speed maneuvers in an outboard motor craft. Many times I've seen crash boats come up from leeward, make several passes and then after gunning the motor, ending up smacking into the capsized sailboat. If I'm operating a crash boat, I make my approach from upwind, place the crash boat abeam of the wind, switch to neutral and then drift down to the capsized vessel. Downwind drift speed is slow and controlled. If I need to make contact with the capsized vessel, I'm approaching at a slow enough speed where it is easy to grab onto the capsized boat or, if need be, fend off. I can assess the situation without worrying about jockeying the boat. I can count heads. I can talk to the crew on the boat or in the water without yelling over a motor in gear. The motor is in neutral. No fear of wrapping lines or injuring someone in the water. If I decide I need to be somewhere else, it is easy to shift into gear and slowly motor sideways away from the capsized boat. It's also easier to throw a line downwind. Music Whenever; Dropkick Murphys "I'm Shipping Up to Boston"
As mentioned previously, American Roger Gintling published plans for a Moth in 1943. It is very, very similar to the Moth Nantais that was built in France during World War II. My scanned copy doesn't give the magazine name that these plans originally appreared in. 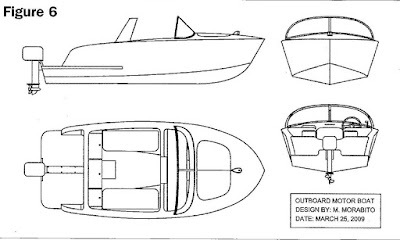 Yes, the "Little Mae Too" is an old design, but, except for the scow bow, the V'eed hull sections of the "Little Mae Too" are similar to the Sunfish or the Snipe, two dinghy classes extremely popular to this day. Vintage Moth designs are stable and good weight carriers. Just the ticket if you want to build a small sailboat for your cabin by the lake or something for the kids to kick around with. One doesn't have to copy the bubble deck design of these vintage boats, a curved foredeck with a flat aft deck would look nice. And it would be good idea to at least have two air buoyancy tanks by closing in some frames with plywood. The following scan of "LIttle Mae Too" plans isn't the sharpest but, combining this PDF file with some of the photos of the Moth Classique Nantais construction, one can get a good idea how to build a "Little Mae Too". I've also fed the line plans through MaxSurf design software which I've put at the end of the PDF file, also with some metric station spacing. To print or download this PDF, move your mouse over the top menu bar. Click on the upward-facing arrow icon in the top-right to open the PDF in another tab on your browser. You can print or download the PDF from this new tab. For a review of Classic Moth designs, click here. It's winter in North America; the season of the yacht club seminars. Lets see, there is always a seminar about how to improve your racing results (probably several of those), a seminar about the racing rules and one for proper race committee procedure; but I have never, ever seen a seminar about the best ways to run a crash boat. Even our hallowed NGB, US Sailing, has yet to put together a course on crash boat operation! Odd, because crash boat operation is such an essential part of safety for the sailors in a regatta. "Ah! ", you say, "No big deal in running a motor boat to and fro, righting capsized boats and plucking those hapless dinghy sailors from the water." Well, it definitely is a bigger deal than most clubs plan for. Operating crash boats safely and effectively in big winds and big seas takes quite a bit of skill and experience. Unfortunately in most U.S sailing clubs, the crash boat operator is the low man on the race committee totem pole; they are usually the volunteers with the least experience. 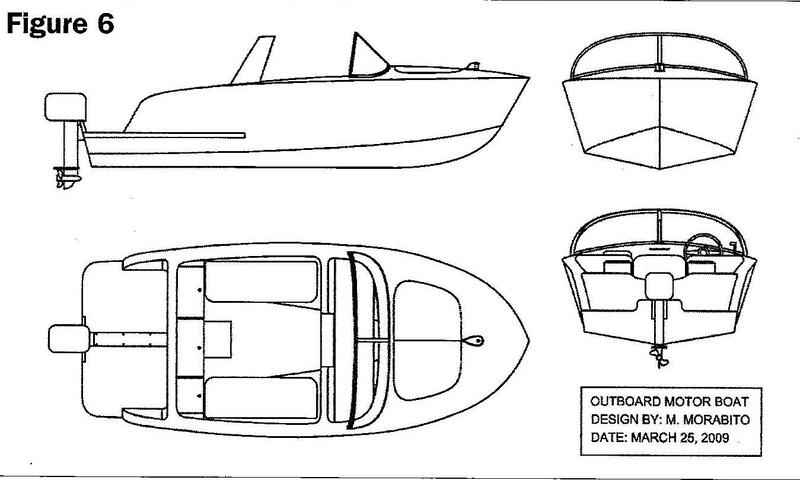 And to compound the problem, most clubs plan on just two crash boats, no matter the size of the regatta. Things can go south quickly when two crash boats with inexperienced operators are faced with multiple boats down! I've done a fair bit of crash boat work (though now, I too am mostly consigned to the main RC boat these days). There are things that work and things that don't work as well. There needs to be some national discussion on best crash boat practices, maybe even a crash boat manual drawn up. And these procedures should be taught every winter! Well not to worry. This subject is certainly worthy of a thread of future posts. I would like to hear of other experiences with crash boats, either as an operator or as one being rescued; good and bad. More news about the French Nantais Moth Classique keeps surfacing. Guimbert Alexis, a 23 year old house carpenter in France, sent along some pictures of a Nantais Moth Classique he built last year. He built it to have a craft to learn sailing and the workmanship is superb! I must admit that I haven't ran across too many young boatbuilders in the U.S, particularly those building sailing dinghies. I would like to see more young people have a go at it. The Moth Classique is an ideal boat for a first time project as, not only is it a small project, but the Moth Classique also offers so many different designs for different sailing abilities as well as different building techniques. The Nantais Moth sports the bubble deck that was popular in the 1940's. This has the big advantage of keeping the skipper out of the water on what is essentially a low freeboard hull. Also the old Moth rule limited the height of the gooseneck to 9" above the deck (correction; from George A's comments, original rule was 12" boom height). This resulted in the old rule Moths having a very low boom. Our current Classic Moth rules in North America eliminated that restriction, making it easier to push the boom up to a height where it doesn't box the ears and force the skipper to kiss the floorboards on a tack. Again, congrats to Guimbert Alexis on a beautiful Moth Classique! The lines to the Nantais. Links to previous posts on the Nantais Moth Classique can be read here and here. 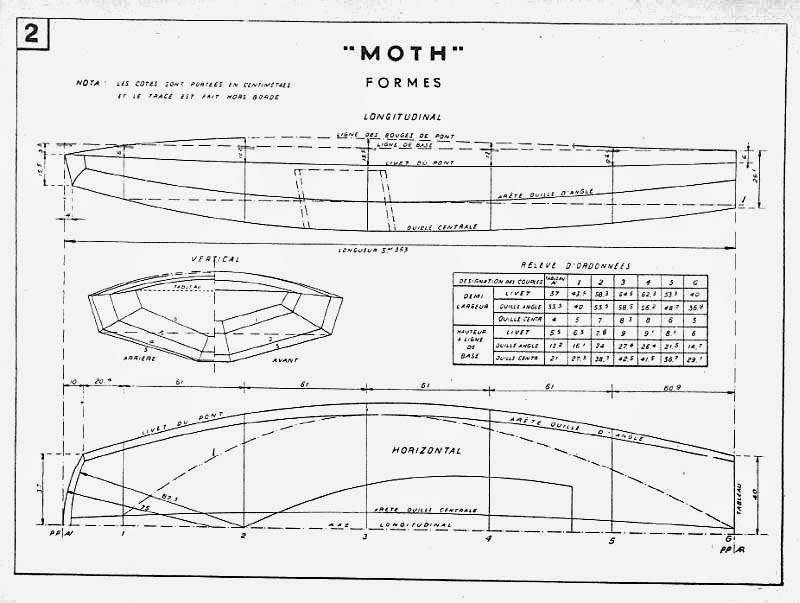 In 1943, American Roger Gintling, published building instructions for his Moth "Little Mae Too" in one of the popular do-it-yourself magazines of the day. It is a close "kissing cousin" to the Moth Nantais. I've posted on the details of the Little Mae Too over here. Music Whenever; Dan Auerbach "Goin Home"